Meet Buck: directed and produced by Laurent Monneron, Yann de Preval, Vincent E Soussa and Denis Bouyer. Buck’s girlfriend is very happy to see him. She’s always happy to see him, despite how he looks. Her dad, on the other hand, is prejudiced. 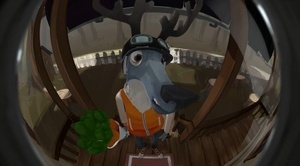 Posted in Misc and tagged Animation, Meet Buck at 1:30 pm on December 20, 2010 by Niall Murphy.